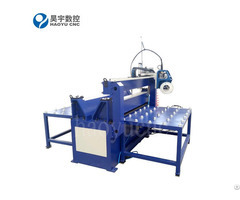 Track Idler Double Stations Circular Seam Welding Machine 1.Main Technical Requirement. The material of rim is 35#, quenching and high temperature tempering(HB167~235). The appearance and size must meet the requirement, not allowed to have undercut, welding tumor, arc crater, burn through, collapse, surface pores, surface cracks and other defects in the appearance. The interior of welding seam should not have the defects of slag inclusion, air hole, non-through welding, non-fusion and internal cracks. Complete the automatic welding requirements for the assembly of track idler. The workpiece needs spot welding in advance. It needs stable and continuous welding process, convenient clamping and loading. 2.Basic Conception Double station, welding at the same time. Welding torch is fixed while the workpiece is rotating. Welding position is horizontal. Machine has high voltage and slow wire feeding performance, which guarantees reliable arc igniting. 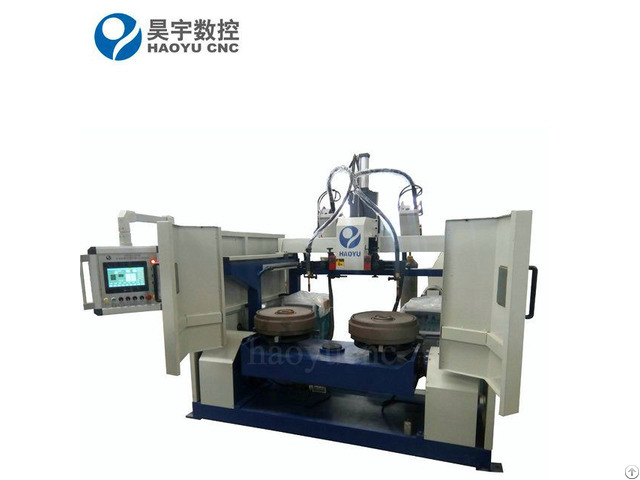 Machine also has low welding voltage and low current for filling crater. PLC is used to control the whole machine operation, the rotation speed of the workpiece is controlled by AC frequency regulator, stepless adjustment, improve the reliability of machine. Two welding torches are separately positioned by CNC. It can move up and down, left and right and angled turn, to reach welding requirement. The welding mode and welding specification can be preset, saved and recalled. Via ouch man-machine interface, the parameter modification and status alternation can be done conveniently. 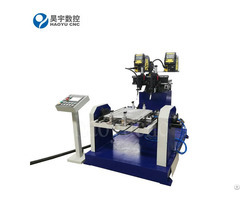 The machine consists of motor-driven reducing speed power head, fixture, conductive system, pneumatic loading and unloading system, turnover mechanism, welding torch CNC positioning mechanism, welding torch clamping&adjusting&am p;oscillating mechanism, electrical control system, welding power source and pneumatic system. 4.Torch Clamping&Adjustment&a mp;Pneumatic Lifting Mechanism It adopts push-type wire feeding mode, to guarantee feeding stability. Welding torch can be adjusted up - down, left -right and angled turn. The fine adjustment of torch uses swallow tail shape and adopts ball screw adjustment, with high accurate adjustment and high positioning accuracy. The oscillating mechanism consists of stepper motor, ball screw, linear guide rail, etc. It adopts closed type structure, shielding the process from dust and spatters. Torch oscillating frequency, oscillating scope, oscillating time, torch lifting time, lifting distance, lifting numbers can be controlled by CNC system. 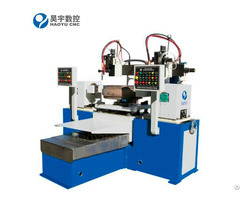 Posted By: Jinan Haoyu CNC Machinery Co., Ltd.
Business Description: Jinan Haoyu CNC Machinery Co., Ltd.is a welding machinery maker in Jinan China . We have a strong design and technical team and can design and manufacture the machines as customer’s requirements. Our products mainly include automatic welding machine, robot welding station, automatic pipe cutting machine, automatic material handling equipment, automatic assembling machine, which are used in the areas of automobile, construction, railway vehicle, electric power, shipbuilding, pressure container, petrochemical, house appliances and military industry, etc.